If you were to ask me 8 years ago when I first moved to London as a uni student where to go for a Chinese meal in London, it would have been a complete no-brainer. Two words: Four Seasons. What to have? : Roast Duck. Discussion over. Fast forward to today and things have somewhat changed. Regional Chinese food has seen a serious revival in London…. With all the choice available these days, I can’t actually remember the last time I had a ‘classic’ Chinese meal. Instead, thanks to regional cuisine flagbearers such as Gourmet San, I’ve found myself drawn towards the tastes of Hunan… Manchuria… Sichuan… new, intriguing flavours which my palate had never quite experienced growing up in Malaysia. And if there is one place which in recent years I’ve started to warm up to (to the extent its subconciously becoming the first ‘two words’ I think of when I think good Regional Chinese cuisine) its Bar Shu. 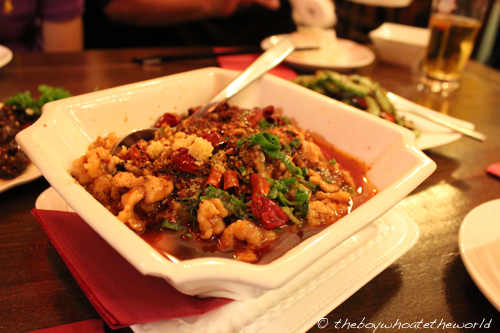 Beware, most of the Sichuan dishes here are mightily spicy and can quite literally blow your sinuses off. So if you can’t handle your heat, you’re probably better off elsewhere. But the fiery flavours are exactly the reason I love this place. The food here makes one feel alive and with the heat comes bagloads of big, complex flavours. The very graphic menu (there’s a full-blown picture of every single dish) and chilli-scale give diners a no-holds-barred preview of what you are getting yourself into. Preserved Century eggs, served cold in a well-seasoned, vinegary chilli oil and topped with pickled peppers had all the elements of sour, spicy, savoury and creamy… a proper wake up call to prepare the salivary glands for the party ahead. ‘Smacked’ cucumbers in garlic sauce however were a little anti-climatic, sounding more exciting on the menu than it actually was to taste. 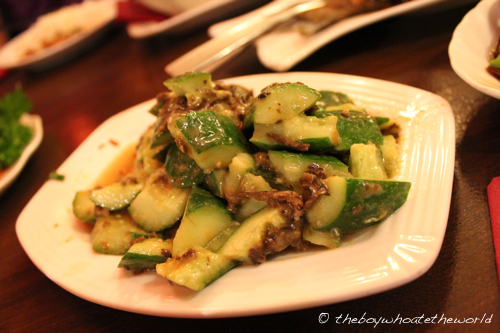 It’s said the cucumbers are smacked and bruised with the side of a cleaver to absorb the flavours of the sauce. 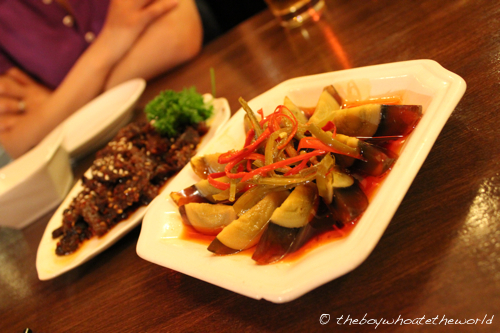 Nonetheless, it paled in comparison to the bombs of flavour from the Century egg. Don’t be put off by the Water-boiled Pork slices which come served swimming in a bowl of chilli oil. After a good shake to drain off any excess oil on the surface, I actually found the meat surprisingly un-greasy (probably a result of the pork being cooked oil-less in water prior to going for a swim). It was also wonderfully tender, slowly melting away in the mouth to release the fiery heat from the mountain of dried chillies used to spike the sauce. 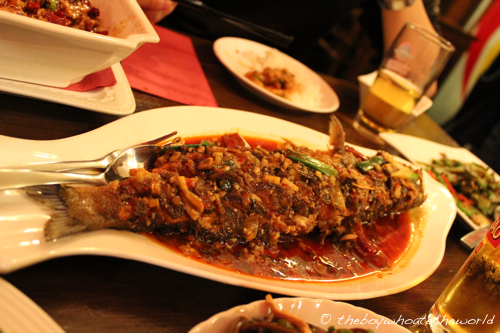 The best dish of the evening though had to be their Chengdu dry-braised seabass. On first looking, it’s a little pricey.. (close to £20 from memory). But the whopper of a bass that showed up which was deep-fried to crispy perfection and topped off with a spicy-sweet-savoury sauce of chillies and mustard greens certainly justified the price tag. It’s a little too big even for two to share, so make sure you have at least 3 to 4 people to attack this dish together. 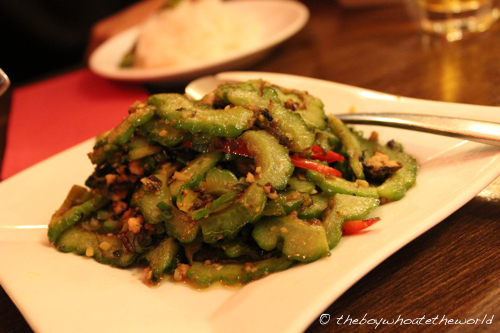 To calm the storm, I always find the melon-ey bitterness of their stir-fried bittergourd incredibly comforting and therapeutic. Again, a beautiful balance of flavours between savoury and sweet with a long-but-not-overly-bitter-endnote. I wish bittergourd was easier to find in your everyday supermarket in London as this is one dish I would whip up at home in a jiffy. All in all, a meal here guarantees to be one adrenaline-filled ride for the palate and taste-buds (if you can still feel them towards the end that is). Just make sure you order plenty of white rice to accompany the dishes. Service was a little brusque and could have been far friendlier and attentive but at least all the food turned up in quick, timely succession.